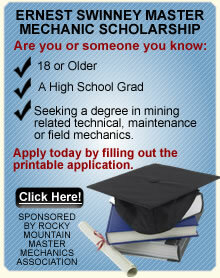 The “Ernest Swinney Master Mechanic Scholarship” is offered to those individuals who are 18 years of age or older, have graduated or will graduate from an accredited high school, and possess adequate practical experience and /or formal training to meet institutional prerequisites and demonstrate sincerity. This award may be used at any nationally accredited institution in the Rocky Mountain Region offering no less than a two year degree in mining related technical, maintenance or field mechanics. The recipient of this award will be required to verify their pursuant of not less than a two year degree in mining related technical, maintenance, or field mechanics. Maintain no less than a 2.0 on a 4.0 scale or C grade average. Scholastic standing to be reported to committee chairperson on a semesterly basis and conform to the governing rules and regulations of the institution. Non compliance to any or all of the above requirements will constitute loss of future awards. All applications must be submitted to selection committee no later than March 1 of each year. To apply for the scholarship you can download the scholarship application as a PDF here or fill out the form below. © 2008-2016 Rocky Mountain Master Mechanics Association. All Rights Reserved.